With Skype, FaceTime, Google Hangouts, Facebook Messenger and a host of other readily available web video chat applications, making a video interview with anyone anywhere with an internet connection is now easier than ever. While this capability can benefit any industry, organization, event, or campaign, I am going to use film festivals as an example for this post. Festival: How can I increase public awareness of our festival and get more people to come out and watch our films? Filmmaker: How can I tell more people about my film? Audience: Which film should I see? Increase awareness - using YouTube to host your interviews makes them easily shareable in online social networks and includes built-in engagement tools such as commenting and liking. Social sharing and recommendations can increase awareness of the films and your festival. Increase engagement - video is the same medium that the film festival is promoting and what the audience is paying to see. It is also the most consumed type of online media. As the medium of choice, video can increase the length of visits and interest in a film festival’s website. Make a connection - seeing and hearing the filmmaker talk about behind the scenes information such as the movie’s story, how it was made, the characters and actors, and its impact all help to create that necessary connection with the viewer to provide more incentive to see the film. Basically, I am more likely to buy something that I have a positive connection to, whether it be the product itself or the creator of the product. Answer decisive questions - a video interview should answer the questions I need answered in order for me to make the concrete decision to see a particular film. This will increase my connection to the film, the filmmaker, and the film festival. Sometimes the questions are as simple as: "What is the movie about?" and "What can I expect to see?" Movie trailers are excellent for answering these questions. Boris Ivanov, the producer, was in Vancouver and I in Ottawa. We recorded the interview in about 20 minutes using Apple’s FaceTime and two video cameras, one recording each of us. After the interview, Boris sent me a compressed version of his recording using a download link and I then edited it together with my video footage. Of course, our recording technique is but one of many options available. There are quite a few options to easily record Skype and other online video calls. Some inexpensive screen capture software may also work. You could also just ask each filmmaker to record him or herself answering a set of questions and then send the recording to you. We simply used what we had at our disposal, set up in the simplest configuration we could devise. A video editing template that will be used to edit all interviews. This will make the editing more efficient and allow the festival to brand the interview videos. Have the questions written out and ready to go. The filmmakers should be sent a copy of the questions ahead of time so they can be well prepared. Remember, each question should answer what you think potential audience members want to know when deciding whether to see the film. Test your system and process for recording the interview. Having a preventable glitch happen during the interview just wastes time. These preparation steps will make shooting and editing your interviews much less time consuming and more enjoyable. Post your interviews on the festival website well in advance of the festival's opening so that there is sufficient lead time to promote, watch, and share the videos. One last thing, give the audience an idea of what to expect in the video interview. If the interview video is longer than 2 minutes, try to give the viewer a way to go directly to the part that interests them the most. For our interview, I used YouTube’s Annotation tool to make the left side navigation menu interactive. If you are using video interviews for your organization, event, or campaign, I would love to hear about your experience! Lara and I have been experimenting with the concept of an entirely mobile production studio using our iPhones and iPad. 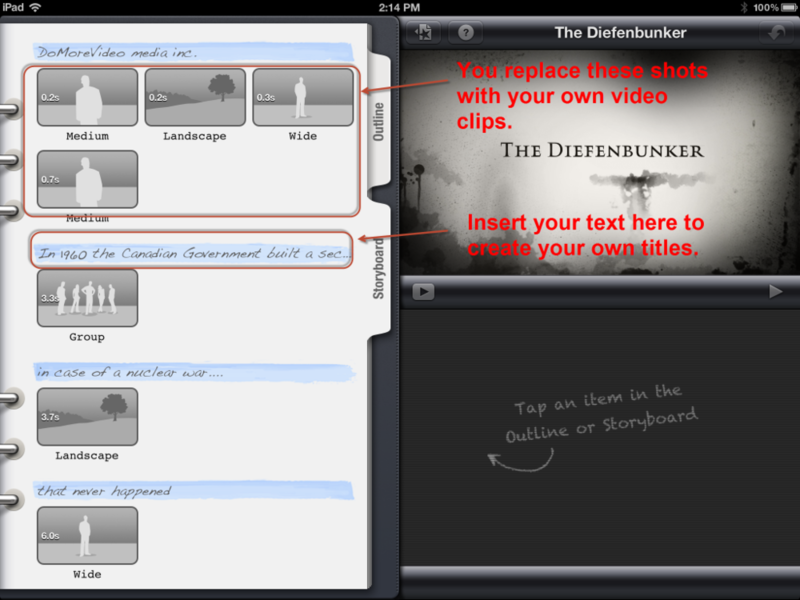 So, when we went to The Diefenbunker - Canada’s Cold War Museum, the other day, I decided to try out iMovie’s new movie trailer templates on my iPhone 4S. Since the templates create the pacing for the video, you are limited to what you can add from the number of video clips, the length of each video clip, transitions, to the audio, unless of course if you render out your video and re-edit it. Knowing ahead of time which template you intend to use will save you a lot of shooting and editing time. As for me, when we went to the Diefenbunker, I wasn’t planning to use our visit as a test run for iMovie and that resulted in the making of the short video that much harder. My biggest hurdle was that we only took one clip of video, walking down the tunnel, and the rest of our visit was captured as photos. The iMovie trailer template that I used only allows you to use video clips. This meant that that I had to convert my pictures to videos before I could use them. I used a variety of photo and video apps to do this. They are all listed below. The edit took me a few hours for a few reasons. I wanted to do it all on my iPhone, I didn’t know the requirements for the template ahead of time, I added effects to my photos and then had to turn them into video clips, the workspace on the iPhone for video editing is pretty limited, and I had no idea what story I wanted to tell. As for the last point, that’s what I get for not listening to Lara’s advice to have a strategy before I make a video. For me, editing on the iPhone is somewhat tedious and time consuming, especially when compared to editing video on my desktop. All that said, what I love about editing on the iPhone is that “I’m editing on my mobile phone!” Come on, that has to give me some Geek Cred. Seriously though, I believe that editing on mobile devices will soon advance enough to make up a certain portion of the videomaking industry. Getting in on the ground floor and honing one’s mobile video production skills, in my opinion, is good training. We are already using our mobile video production experience for some clients at their events. The ability to be truly mobile meant that I didn’t have to sit at my desk to complete the project. I was literally editing while having a coffee at a local cafe, while walking around in our living room , while reclining on the couch, and sitting at the kitchen table. Limiting my colour palette of video tools meant that I had to get a lot more creative in order to achieve the desired result. I look forward to creating more mobile productions and editing on the iPad! A movie trailer type of video is a great tool for businesses and nonprofits to promote specific events, exhibits, and campaigns. Of course, you will need other sales and education assets to support your video, but you should be doing that anyway for all your videos. The iMovie trailer templates are so easy to use that beginners can start editing video right away. The Storyboard view for each template is excellent. Not only is it intuitive enough to get you started editing it also provides a great way to learn about video pacing, different video shots, transitions, and storytelling. This type of knowledge will certainly help aspiring videomakers take the next step of creating effective videos outside of iMovie’s trailer templates. I would love to see any videos you have created or favorited that were shot and edited on a mobile device, so please share. Until my next post, happy shooting and editing! Welcome to the final instalment of our three part series on how to create more videos without shooting a single frame. The goal of this series is to help remove the technical barriers to shooting and editing video so that you can make video even if you don’t have the gear and editing know-how. In Part 1, we discussed how to make animated videos from just a written script, in Part 2 we introduced you to Animoto, an easy to use tool that makes professional looking videos from your photos. Today, is all about curating video by building YouTube Playlists. Instead of making your own videos, you are curating or choosing the best videos for your audience and packaging them together into playlists. Did you know that every minute 48 hours of video is uploaded to YouTube? That’s a lot of video. So, sifting through and finding the helpful ones for your customers is of tremendous value to them. At first, you may think it will take a lot of time to find and review all the relevant YouTube videos. But, think about how long it would take to produce an original video of your own. Also, by locating and reviewing existing video in your sector is great market research that all businesses and organizations should undertake before building their own product. Create better content: Being aware of what video content already exists enables you to more accurately assess what information and service gaps exists in the specific topic area. Now you know what content to make next: i.e. content that fills the gap and satisfies the need for information on that subject. These benefits of curating apply to any content strategy from video to seminars to print. Length: I suggest that your playlist comprise of about 5 videos at most with a total playing time of no more than 8-10 minutes. You don’t want to overwhelm your viewers. If you have a lot of videos, consider breaking them up into more than one playlist. Set the context: Use the description box for the playlist and the notes tool for each video to give your viewers an idea of what the playlist and each video is about. You should highlight in each video points of interest to viewers, or in other words, why you created the playlist and included that video. In the description box you can add hyper-links to additional resources and your call to action, which is discussed in the next tip. I strongly suggest that whenever you compile any type of resource list that you provide a brief summary of each resource. It makes your list more useful and user friendly for your customers. It also increases your credibility because it shows that you actually gave each resource some thought. Call to action: Use your playlist to help support a blog post or other social media post and provide a call to action in the post and the playlist’s description to enable viewers to take the next step to either more information or apply the knowledge they just soaked up. Curating does not replace the need to make your own original content. It is however an easy way to publish initial content, supplement and support your own content, and provide you with guidance as to what original content you should create (remember the benefits to being a curator above?). Check out Part 1 and Part 2 of this series to learn how you can create original video content without shooting or editing a single frame. I realize that my playlist is longer than the suggested length, but I really didn’t find many releveant videos on the topic. I used the notes to advise viewers that one of the videos is longer than the others. Just from making this quick playlist I have learned that: 1. The number of videos promoting payday loans far outnumber the videos warning people about the pitfalls. 2. Of the few videos out there about what one should know about payday loans, none were Canadian focused. Thanks for checking out our series on how to Do More Video Without Shooting Video. If you have any feedback about the series or examples of any of the methods that you have tried for your own business, please share. We would also love suggestions on other topics that would help you to develop your capacity to make video. Feel free to drop us a line with suggestions anytime!